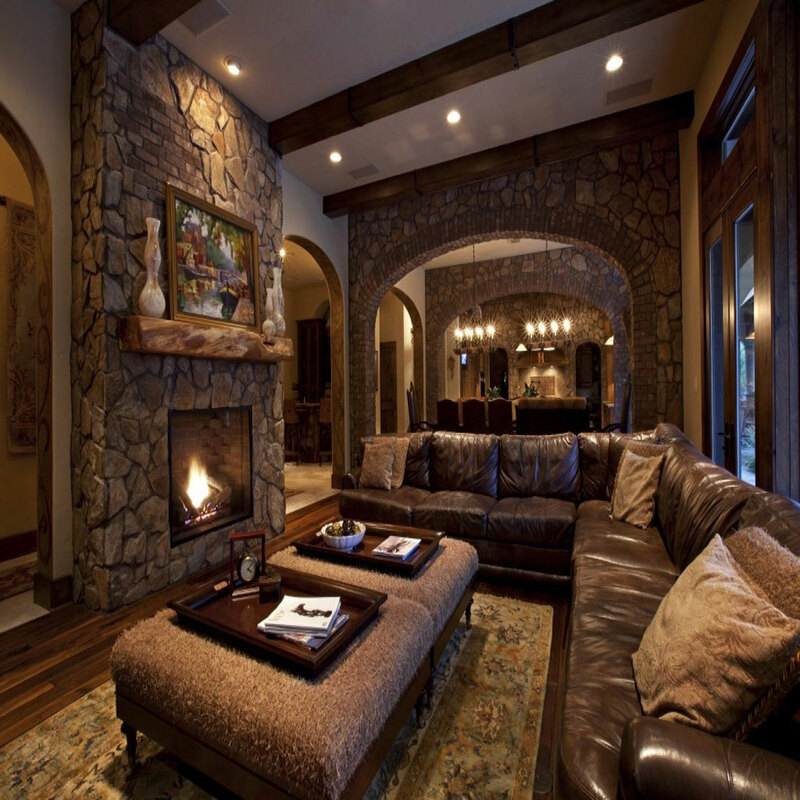 Rustic style interior design describes the range of styles with an emphasis on natural and unrefined elements. It is drawn from natural inspiration, using raw & unfinished elements including wood &stone. Naturalness, elegance and accentuated roughness of natural ambience component – that’s what the Rustic interior design known for! 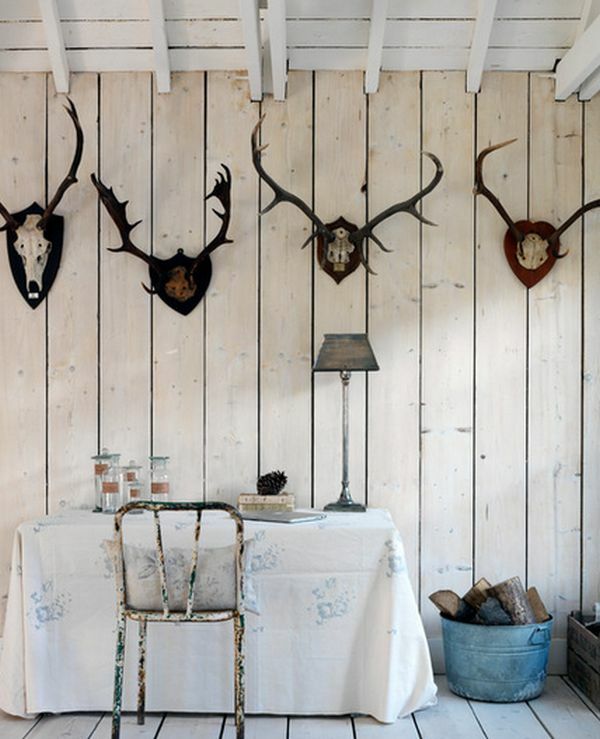 The best rustic interiors find a perfect balance between rough& comforting. 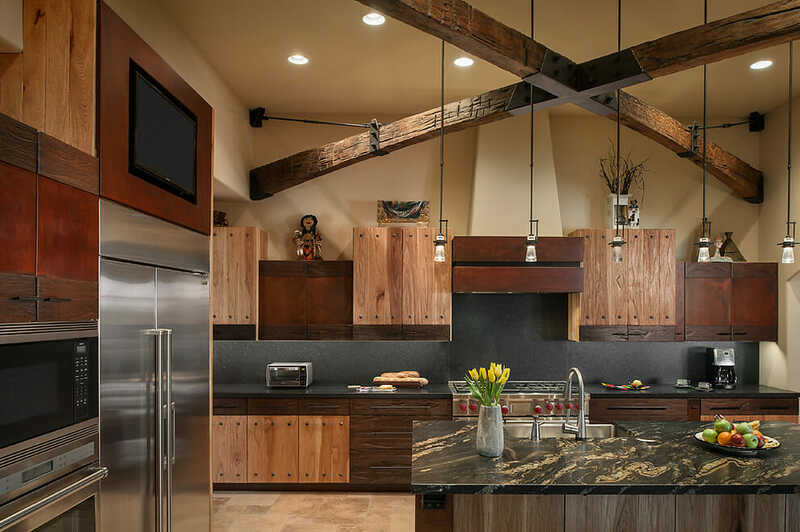 The rustic interior design style highlights the authentic beauty of natural materials, celebrates the unfussy tastes & simply makes us feel at home! Must Read: Ultimate List of Interior Design Styles for your Home Interior! Rustic furniture design normally consists of wood, reclaimed lumber, & stone. However, bamboo, sisal, rattan, nubby cotton, wool, clay, glass, paper & various types of metal can also be incorporated to adorn the look. Metal worked furniture is another great option to use with this concept! The rustic look features the wooden beams & columns as well as hardwood or stone flooring. 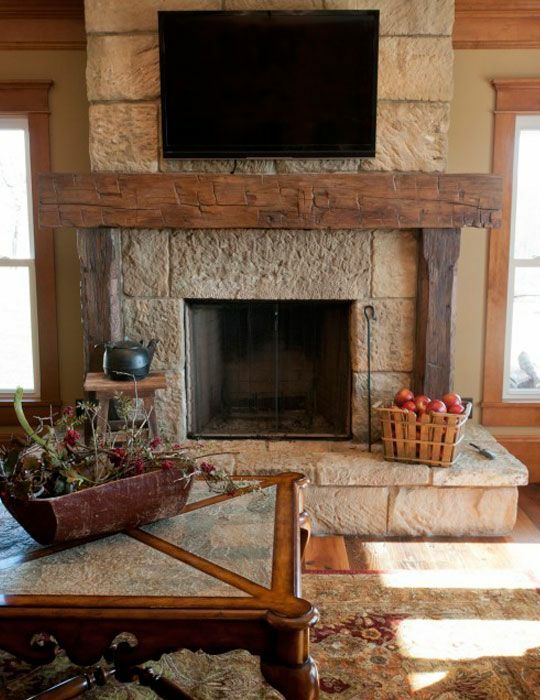 If you don’t have these elements as structure, you can also use faux beams & columns to achieve the rustic look! Secret Ways to Introduce the Comfort of Rustic Interior Design Ideas for Your Home! When we think of “Rustic look”, the wooden beams is the very first thing which comes to your mind! This architectural element has become the essence of rustic design. When left rough & unpolished, it automatically adds the perfect amount of character to space. It ties the space together by bringing the rustic style all the way to your ceiling. You can use this beams to frame ceilings, demarcate door & windows, to surround fireplaces or even to line the walls. These beams can also be incorporated in the form of round logs. 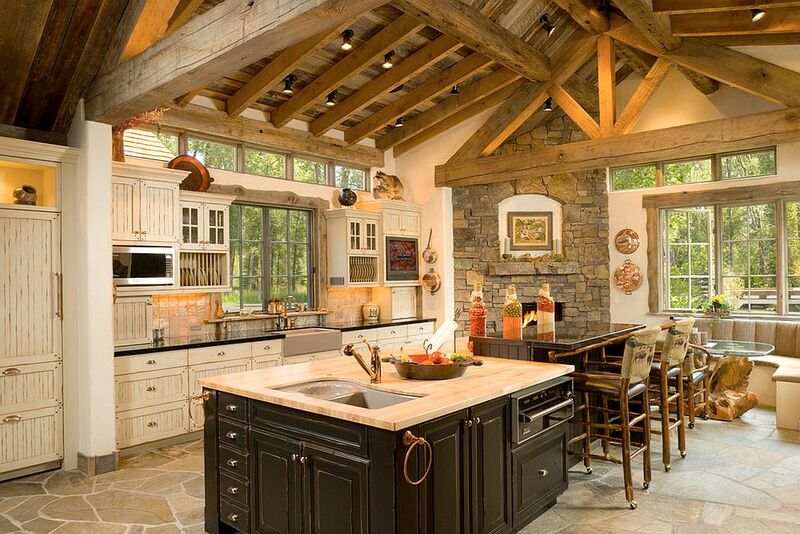 Often, the ceiling beams are chunky & large that are an excellent reminder of the great outdoors! Paneled wall gave you an architectural touch that provides the cosy surround to enjoy the rustic style. You can also have the plain white walls which provide an excellent blank canvas to work with rustic décor for your room. White walls are bright, cheerful, & incredibly versatile in helping to create the fresh rustic feeling for your house! You can use the pieces made of natural wood for the rustic interior, as the use of overly tailored pieces dilutes a room’s rustic style. Instead, you should choose the furnishings & objects that are strong & have slightly rough profiles, such as the wooden bread trough as basins, woven baskets, trays, etc. as shown in the figure. In rustic décor, you can use the basket of logs on the fireplace hearth or baskets of a small collection on the shelves, or you can even use the basket on the coffee table! This is probably the most important feature of the modern rustic interior. The Lovers of rustic style interior design usually want to bring the nature inside. For e.g. If you have an old home, it is important to preserve the character & original architectural detail i.e. show off that old stone wall! If you are building the new one, then you can expose your beams, use reclaimed wood, or can also include a stone fireplace. The modern rustic interiors never forget the fifth wall- the ceiling! Frame homes with wood covered ceilings or large beams are quite popular that adorns the rustic look! In rustic interior design, there is no room which is over cleaned & have pristine spaces. When something is weathered, it takes away the newness that object or material had! Without shine, it adds the right amount of character to space and creates an ideal rustic feeling for your room! 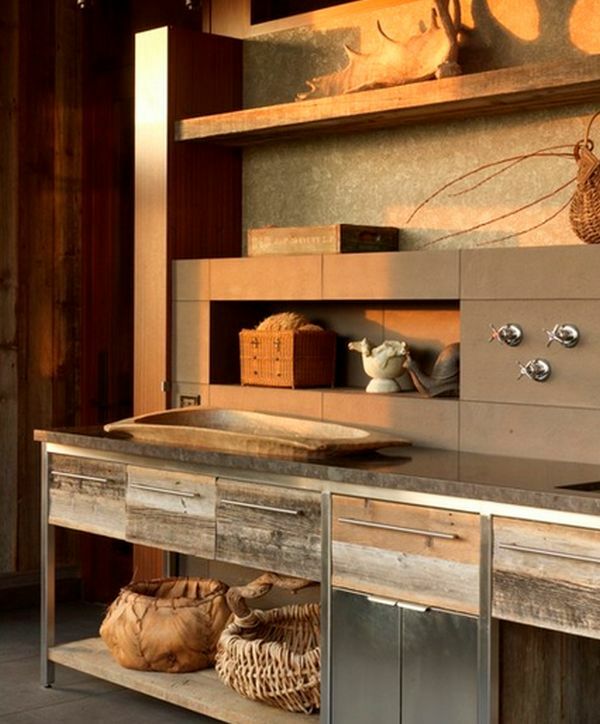 When capturing the true essence of rustic design, the use of warm colours is significant. You can incorporate the sense of warmth through many aspects in space. 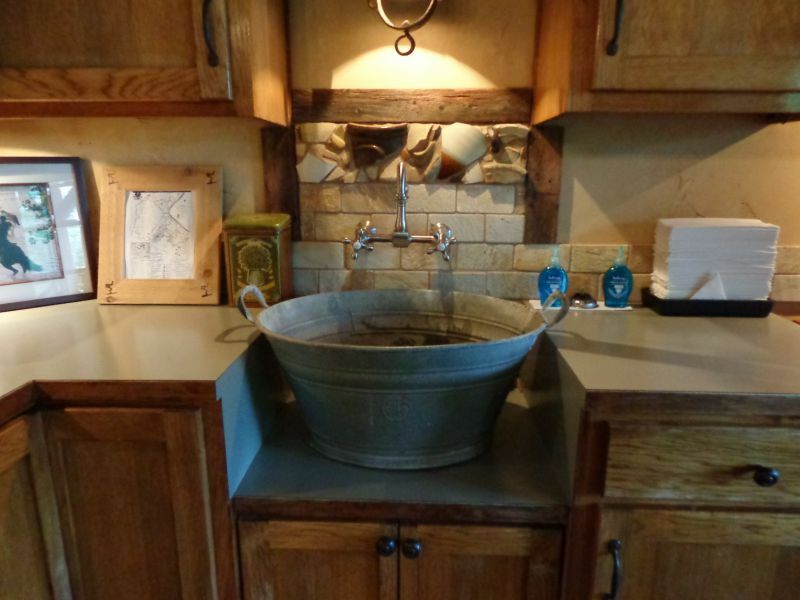 For rustic style, it is mostly developed through the use of wood, paint & fabric. It is not always necessary to stick with brown colour; you can also use the hues of red, yellow & orange families! While nature has its fair share of gorgeous vibrant hues, the typical rustic style is best served with nature’s more muted tones. You can have sand-coloured rustic furniture, rich mud brown walls, or pine green accents. These colours are soothing & evoke the earthiest of Mother Nature’s masterpieces! For the simple rustic look, along with the use of natural woods & décor elements, you can keep your walls white, or cover them in a natural material like wood or stone. Keeping with the actual theme of the past, refurbishing accessories adds charm & simplicity to rustic interior. 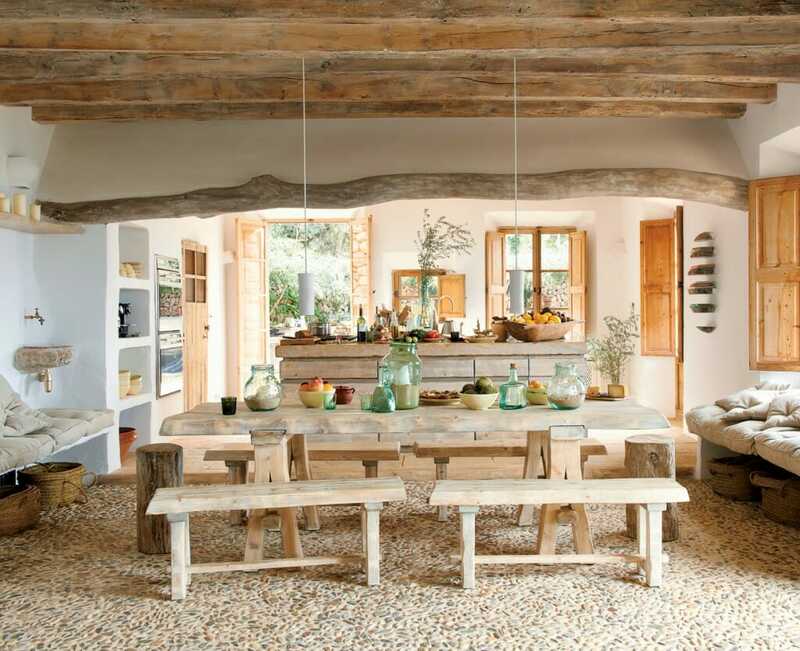 To a large extent, the rustic style is about making what you have, just as it was in the old days. The objects such as, Wire baskets transformed into light fixtures, old bucket turned into sinks, Turning old shutters into artwork, wooden crates re-imagined as stair treads pay homage to the idea of using what you have like they would in the earlier times. It creates that sense of serenity and peace that stem from the rustic interior design ideas! The best materials for the base of rustic interiors are unprinted & textural. Fabrics used for rustic interiors are sturdy & hardworking that can take little wear & tear like linen, burlap, cotton, wool, etc. The natural aspect of a modern rustic home carries through to the upholstery, linens & rugs – animal hides (faux). The fine textiles like silk & lace, don’t have much of a place in rustic interiors! Big windows are another important feature of the modern rustic interiors/homes. In fact, this is a feature that satisfies both – rustic interiors&modern rustic sensibilities, making it a decisive design component to this style of home! 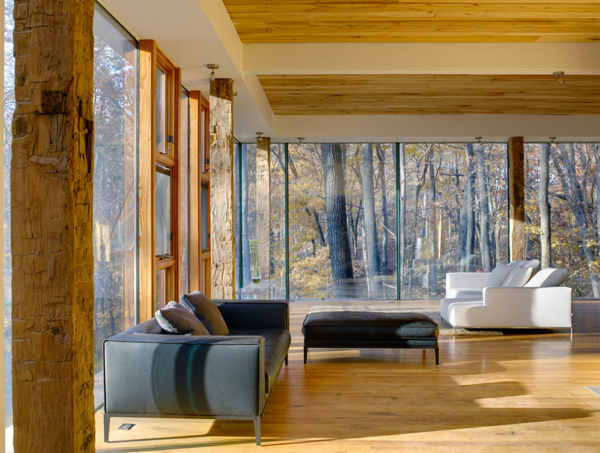 As the modern home is always open & full of light, making windows as a trademark element is important. Similarly, the rustics want their space to feel as close to the outdoors as possible, therefore an easy sightline to the outdoors is rustic’s top priority. 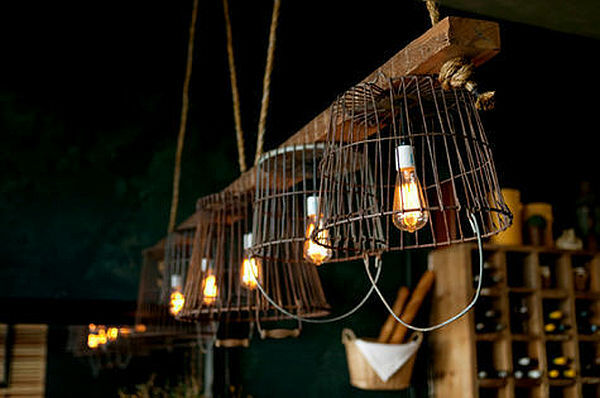 Go for a lighting fixture that embodies the rustic style. Fixture made with iron or weathered metal, show-stopping chandeliers bring an old world charm to any space! 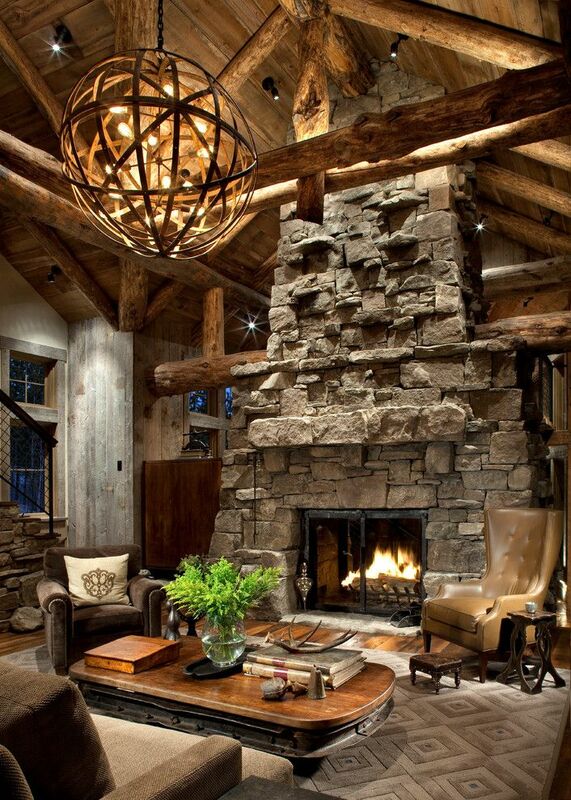 Rustic styled home is incomplete without the warm, inviting fireplace. It is all about being cosy; the fireplace best fits in the natural-styled home. 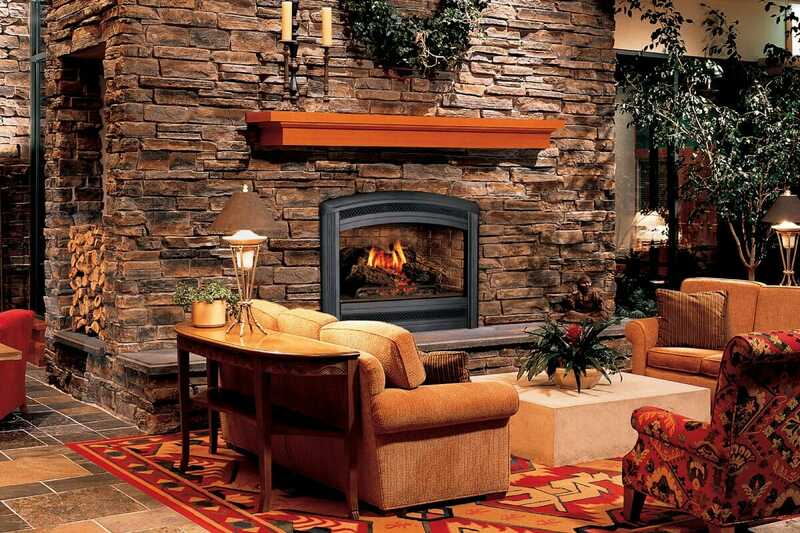 Its surrounds are made out of visually weighty natural elements like rock, stone or brick along with a thick chunky mantel (wood piece) is an ideal for rustic living or family room! Therefore, it is benefited if you are living on the ground floor like in an individual bungalow, you can get easily connected to nature by having front/backyard gardens. While living in an apartment, the rustic interior design style offers an opportunity to make your home an island of harmony, comfort and connected to nature! 7 Key Features of Industrial Style for Your Interior! Minimalist Interior Design Style:7 Interesting Ideas for Your Home! Guide to Decorate Your Home in Contemporary Style!